Mix all ingredients together, cover and let sit in the fridge while the beets are roasting since the longer it sits the better it tastes. Beets are hands down one of my favorite winter veg; and this variety photographs beautifully. Tasty and pretty- what a catch! I have missed you! Life gets in the way of blogging sometimes huh. I'll look forward to what you have in store for us! Gorgeous. I especially love this post because I'm a beet addict. yum! love the colors in those beets. 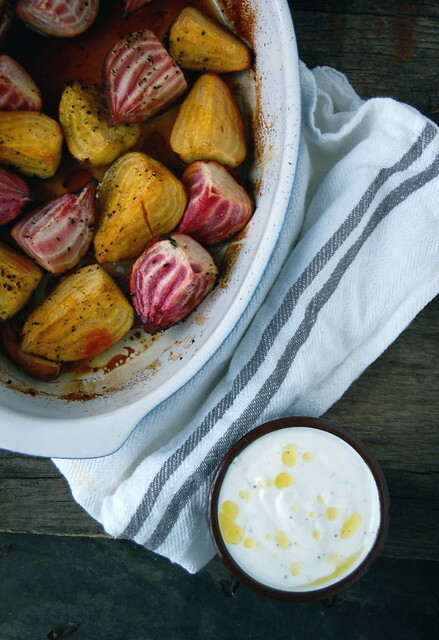 Love the garlic yogurt with the beets! Yum! I agree, the yogurt with beets combo sounds fantastic! Hmmm...I'm not a beet person...but yours look rather exotic. I've seen beets all over the blogosphere so perhaps its time I tried them :) The galic yoghurt sounds rather perfect though. The pink candy cane beetroot is so pretty! Love this healthy, summery idea. Love beets and I can have them anyway! This is so beautiful. Roasting brings out the natural sweetness and the combo sounds fabulous.Love your space.